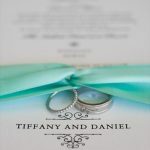 We met Rebecca & Marc via Duncan Reyes Bay Area Wedding & Events Planners. Hyegraph Invitations & Calligraphy was happy to help design the couple’s Engagement Invitations, Wedding Invitations, Calligraphy, Menus, Programs & Place Cards. 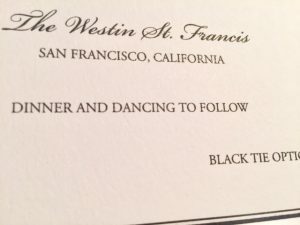 Below are their Wedding Invitation Details. 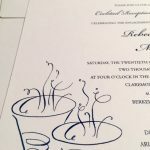 Rebecca & Marc’s Wedding Invitations are from Checkerboard Designs which are now Designer’s Press. The invitation is in two layers. The back is Black and the top is a white card. The printing is Thermography in black ink and the couple’s monogram is in gold ink. The type style is Bickham & Garamond Upper Case. Rebecca & Eric’s response card is more detailed than most response cards. It details the menu options for the respondents; “Artichoke and Spinach Stuffed Chicken Breast Sauce Perigeaux”, for example. 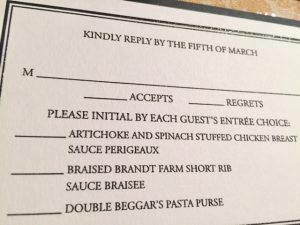 The response card matches the couple’s wedding invitation suite. It is a heavy two layer card in white and black with double black borders and thermography printing as seen above. The couple also decided to include a separate Wedding Details & Directions Card in matching design since they did not have a reception card. The couple were married in April at the Historic Westin St. Francis Hotel in San Francisco. Their photographer is Clane Gessel, Wedding Cake is by Susan Marie Baby Morgan, Wedding Day stylists are Stephanie Jackson & Kathryn Martin. Jacques also addressed the couple’s Wedding Invitation with Hyegraph’s Envelope Addressing, printed the wedding place cards, menus and programs. Congratulations to our couple and Best Wishes!